The topic/title I was given for my presentation at the EV Transportation & Technology Summit was “EV R&D and the Future.” You can jump right into the presentation below. In addition to that, or alternatively, you can read more about the backstory and a summary of the presentation in the text below the video and slides. My initial inclination with “EV R&D and the Future” was to write about “promising” EV battery chemistries and projected improvements in battery cost, as well as expectations regarding future electric car models and electric car sales. However, data collection for our new report — Electric Cars: What Early Adopters & First Followers Want — was wrapping up, and I asked about including findings from that in my presentation, to which the main organizer gave an enthusiastic vote of support. As I practiced the presentation on innocent lay people (aka relatives), I felt more and more that I needed to kick things off with some of the core benefits of electric vehicles. After all, that’s what provides electric vehicles with a notable future. Plus, many people are still more or less unaware of these benefits. Once I jumped into “the future,” I highlighted a chart from a McKinsey report that our wonderful advisor Bob Wallace often shares that tries to show when exactly electric cars are competitive purely on a financial basis. Note that this chart ignores the 5 benefits listed above. Estimates from various analysts put current Tesla battery pack costs at a point that makes Tesla vehicles competitive with conventional ICE vehicles (again, purely on a financial basis) with gas prices somewhere between $3.25 and $3.75/gallon. And, most exciting of all, various estimates put Tesla battery costs at a point that would be competitive with ICE vehicles at sub-$2.00/gallon to $3.00/gallon once the batteries are being produced at the Gigafactory. The Tesla Model S is already outselling the Mercedes S-Class, BMW 7-Series, Audi A8 & A7, and every other large luxury car on the US market, and is in a similar place in Europe. So, currently projected competitiveness seems to match well enough, and I’m confident the Gigafactory and Tesla Model 3 will expand that competitiveness considerably. I then spent a little time highlighting current EV battery leaders, and then finally jumped into the types of batteries and startups that could lead to the next big step forward in the EV battery space. Then I discussed some of the goodies from Electric Cars: What Early Adopters & First Followers Want — before the report was fully written and had a name. 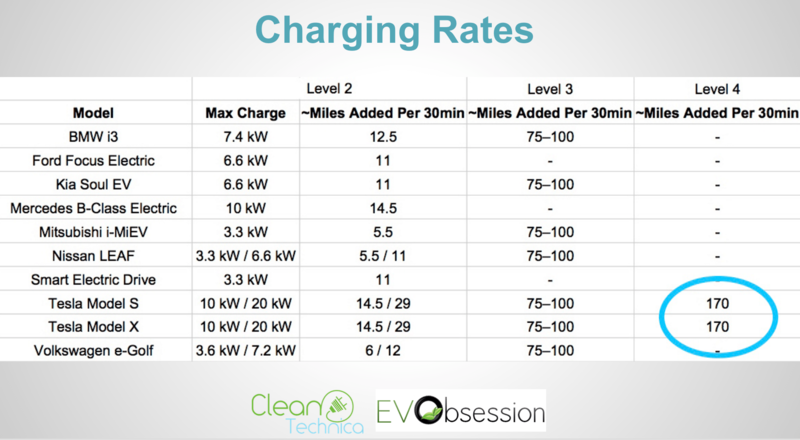 Setting the stage regarding charging rates was important, imho, as a lot of people don’t realize that Tesla Supercharging is about twice as fast as DC fast charging available for other electric cars… and no other charging network on the planet offers anything close to its rate of charge (~170 miles per 30 minutes). No other charging network, of any speed, is as usefully installed and integrated across the US and Europe, either. Unsurprisingly, our well educated survey respondents hugely prefer Tesla’s super-fast charging network. 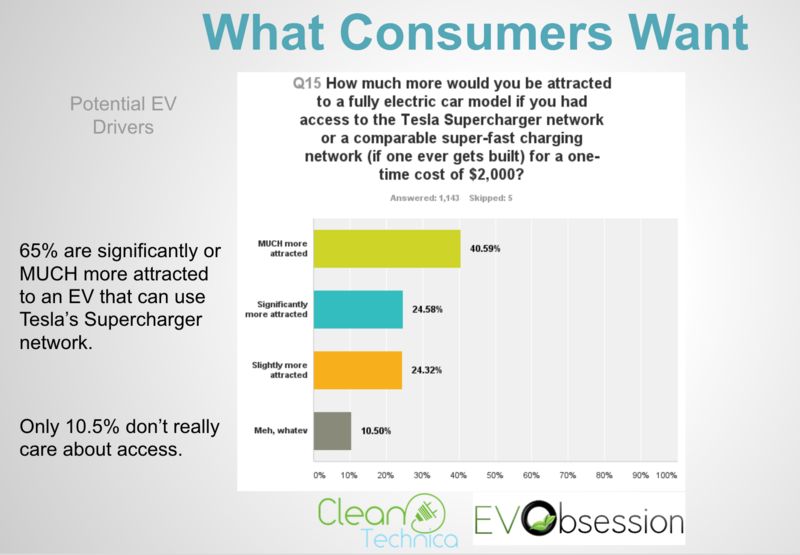 65% are significantly or MUCH more attracted to an EV that can use Tesla’s Supercharger network or a theoretical comparatively fast network. Only 10.5% of respondents don’t really care about having access to such a network. Similarly, potential EV drivers indicated they were more likely to buy the Model 3 than any other electric car on the market or coming to market in the next few years. 56% of respondents indicated this preference, compared to 33% for a 2nd-gen Nissan LEAF, another 20% for a Tesla Model S, 18% for the 2nd-gen Chevy Volt, another 17% for the Tesla Model X, 17% for the Chevy Bolt, and nothing close to these percentages for any other electric cars. Current EV drivers favored Teslas even more, with the top three choices for their next EV purchase being the Tesla Model 3, Tesla Model X, and Tesla Model S.
There were also interesting results regarding range requirements, range–price tradeoff preferences, and battery upgrades that I’ll highlight in more depth in articles coming in the next week — or you can just check out Electric Cars: What Early Adopters & First Followers Want and/or the video above for more discussion on those matters. I closed the presentation with a reminder of what disruptive technology is and how such tech comes to take over the market. 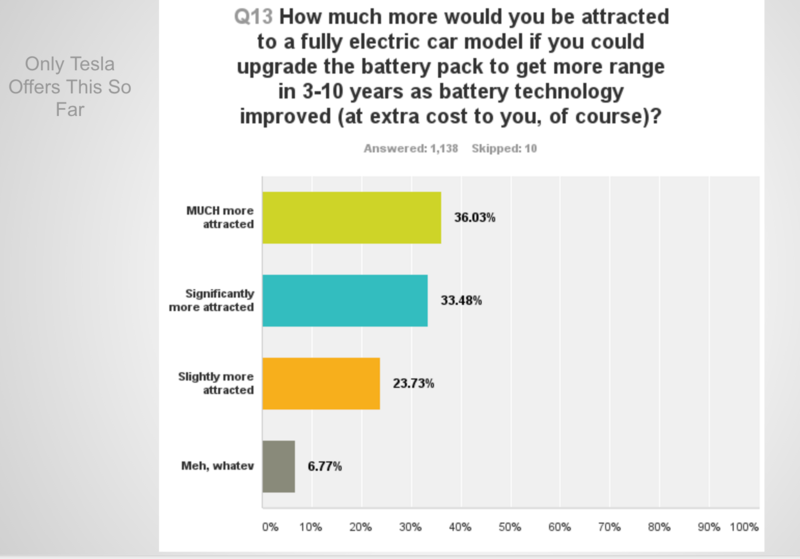 Thanks again to all of the readers who answered the surveys that generated the findings for this new report, and thanks to Doug Kettles for inviting me to present at the inaugural EV Transportation & Technology Summit in Cocoa, Florida.